Rice is a staple food for over 3 billion people worldwide. Unfortunately, rice contaminated with arsenic can be found in several regions of our planet. Although serious concerns have been raised in the past few years over the consumption of rice tainted with high levels of arsenic, there was no direct proof of its harmful effects on human populations. Now, results from a new study indicate that staple consumption of cooked rice containing high levels of arsenic leads to genotoxic damage. Arsenic, one of the heavy metals, is a chemical element normally present in water, air and soil. It is released from volcanoes and from the erosion of mineral deposits as well as from human activities (mining, burning coal, oil, gasoline and wood). Presence of arsenic in the environment is also due to its use in compounds such as pesticides, herbicides and wood preservatives. The arsenic content in rice varies widely depending on the rice provenience: rice grown in arsenic-contaminated soil and groundwater contains higher arsenic than average. The new study, entitled “High arsenic in rice is associated with elevated genotoxic effects in humans” and published on July 22, 2013, in the scientific journal Scientific Reports, was designed to determine whether or not cooked rice with high arsenic content is sufficient to cause genotoxic effects in humans in absence of any additional exposure. The study populations consisted of individuals living in rural West Bengal, India, eating rice as a staple. 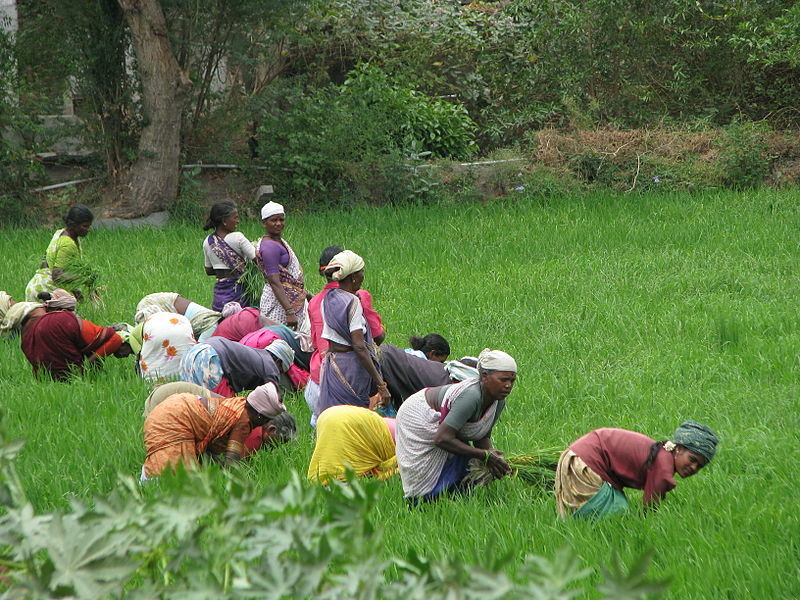 Women harvesting rice paddy in Tamil Nadu, India. To determine arsenic toxicity and genetic damage the investigators determined the frequency of micronuclei – a tell-tale sign of chromosomal damage – in cells extracted from urine samples. Increased frequency of micronuclei is known to be linked to the development of cancers. The investigators demonstrated that people eating rice containing arsenic in amounts greater than 0.2 mg/kg had higher frequencies of micronuclei than people consuming rice containing less arsenic. The trend of greater genetic damage with increasing arsenic in rice was observed for both men and women, for tobacco-users and non-users, and for those from three different locations within the study area. The pattern observed was broadly similar to that previously seen for people exposed to arsenic through drinking high arsenic well waters, which has caused devastating health impacts, including cancers, in many parts of the world. Rice is not the only type of food that may lead to high levels of arsenic exposure. Another example is that of cooked chicken breasts. As you may remember from one of our previous posts, “Arsenic in Chickens: Finding More of What is Already Known“, a recent study found that several samples of U.S. chicken breasts contained potentially harmful amounts of arsenic, in this case deriving from roxarsone, a drug routinely administered to chickens. Apart from genotoxicity from exposure to arsenic, the immunosuppression of the individuals is a factor that strongly heightens chances of cancer development. Studies have shown that arsenic exposure on human populations hinder proliferation of peripheral mononuclear blood cells and alter cytokine secretion. Arsenic also reduces the ratio of CD4 T-helper cells in contrast to CD8 cytotoxic T- cells in exposed children, which is a key indication of immunosuppression. Arsenic exposure also increases the secretion of certain inflammatory molecules resulting in chronic inflammation which is a sign of cancer development. Furthermore, arsenic can interfere with the CD4 Th1/Th2 cell differentiation pathway causing them to undergo apoptosis which will ultimately lead to an inadequate immune response. These studies have indicated that arsenic exposure can alter different cell types in individuals, but these alterations can vary from person to person as age, gender, and nutrition status play a tactical role in possible exposure effects. Reference: Vega, Libia. (2009) EFFECTS OF ARSENIC EXPOSURE ON THE IMMUNE SYSTEM AND MECHANISM OF ACTION. Environmental Health Risks. Study after study has shown that rice products contain more arsenic than any other grain. Regulatory agencies need to set safety standards for rice as soon as possible.